The destruction of the Order, the death of his friends, exile – no matter what he has endured, YODA will always be a Jedi. Even in hiding on the isolated planet of Dagobah, far from the evil Empire’s reach, a Jedi’s work is never done. Marc Guggenheim (X-MEN GOLD) and ANDREA BROCCARDO (STAR WARS) will pay the wise, old master a visit! 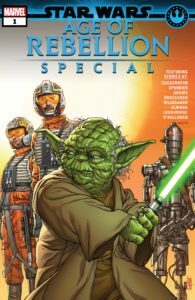 The freedom-fighting REBEL ALLIANCE has more than its fair share of heroes – like ace pilots BIGGS DARKLIGHTER and JEK PORKINS. But they’ve been fighting the evil Galactic Empire for a long time and sometimes, even noble warriors like Biggs and Porkins need a little rest and relaxation. Is anywhere truly free from the trials of the galactic conflict? Writer and illustrator JON ADAMS (the New Yorker, LOVE ROMANCES) has the answer!